You guys! I've missed you! Long story short, I started a new job and I've been SUPER busy. Finding time to juggle a full time job, blogging, working out, cooking, cleaning and spending time with my boyfriend is a struggle. If anyone has any advice, help a sista out! Anyways, I cannot believe we are two weeks away from Christmas! I took an entire week off and I am so excited to go home and see my family & friends. If you’re anything like me, you've been procrastinating and haven't bought all of your gifts yet. That's why I decided to share 5 gift ideas for him and her to make your shopping a little less stressful! I also wanted to show off this Christmas look your could wear for a holiday party or work event. I bought these boots last year but there are so many cute OTK boots out these year that its making me want a black pair! 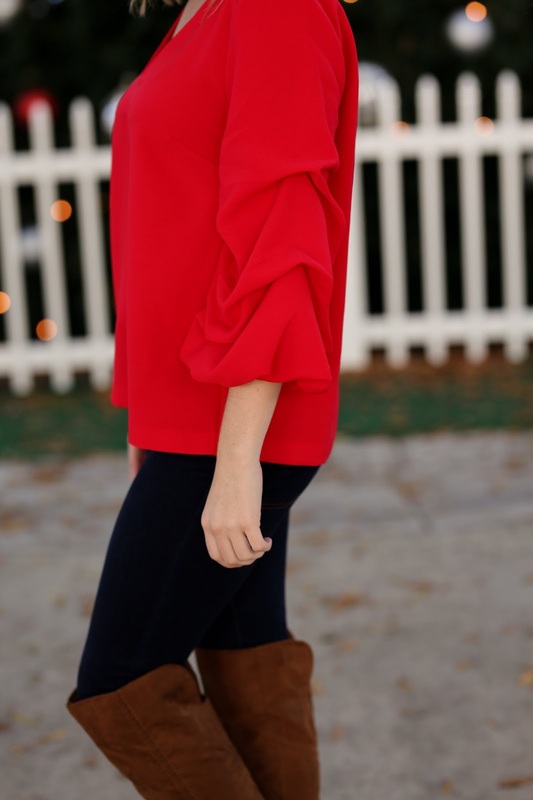 This wide sleeve trend is seriously my favorite right now. Its so cute and adds pizazz to any outfit! Now on to the gift ideas! Click the links to see my top favorites!